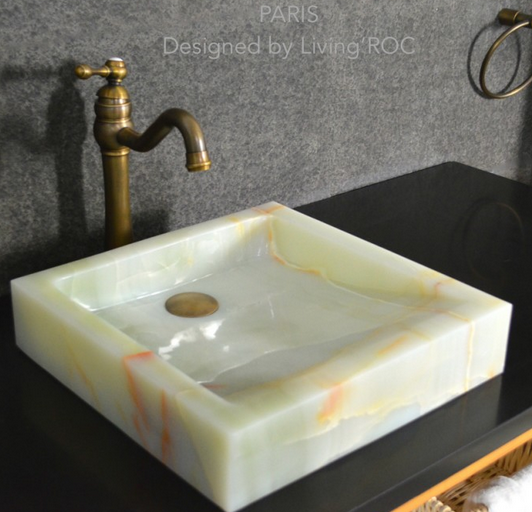 LivingRoc USA-The Blog: SPRING IS HERE !!!!! Spring is upon us now. This is a great time to do your upgrading and remodels in your home. A beautiful manicured bathroom will set the mood in your morning to help you embark on the day. Why not bring in the nature aspect into your surroundings to add a spa luxury feeling to your morning routine. Livingroc can add the perfect touch to help you create a room that you will not want to leave. 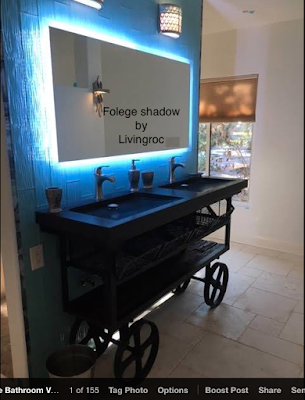 When you are in need of a double basin we have a exceptional natural stone product our 63'' Black granite stone bathroom trough FOLEGE SHADOW. Natural stone is a great element to bring the outside into your surroundings. 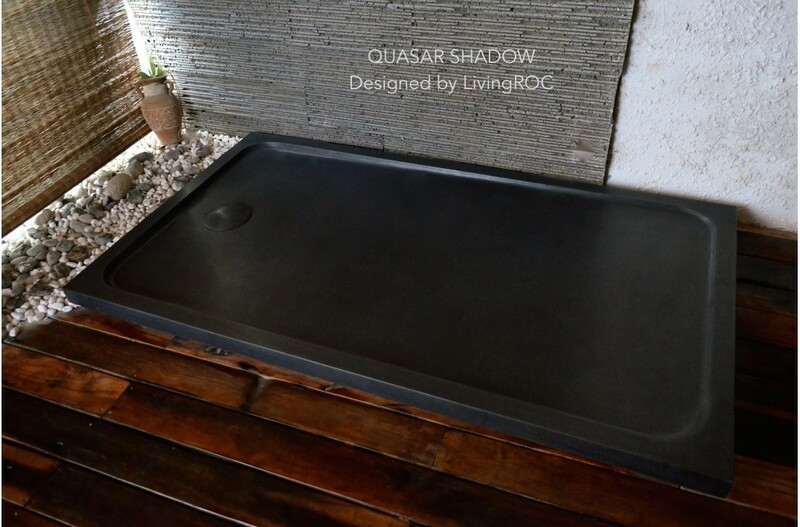 Add value to your home by installing Livingroc creations by using this nobel stone made of pure black Shanxi granite. If you wish to standardize your project, you can choose among a variety of sizes with our shower bases made in granite. QUASAR SHADOW is a French style rectangular natural stone product. With a generous size of 60x34x2'' our shower base will definitely add a complete look to your renovation. Marble with distinct gray veins thru out the stone has indeed created a masterpiece. Carrara and other white marbles have been most popular for use in sculptures and building decor. 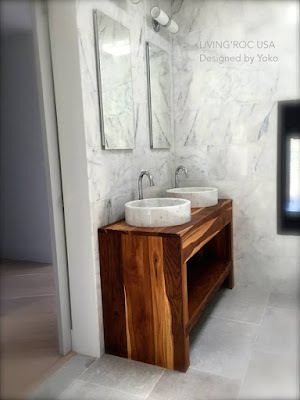 Some are afraid of using marble however it is a beautiful stone to use for your bathroom remodels. And will stand the test of time. With a little care of sealing your stone 2 times a year , you will have no trouble welcoming this elegant piece of luxury into your area. Here we have a customers installation with Livingroc's RONDO WHITE . Our products can not be compared to standard quality plastic/porcelain vessel sinks. With pure and sleek lines that will give a chic look to your bathroom with its white and gray tones to create a fashionable bathroom decor. A trough design is a great choice to add to your bathroom renovation. Made from a superb block of Carrara white marble this bathroom sink will delight lovers of beautiful work looking for rare products to add value to your home. 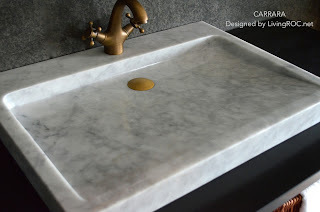 Our CARRARA 27'' trough is a wonderful selection. We invite you to also look into our many styles, shapes and sizes for any homeowner wishing to add elegance and tranquility. Please visit our site at LIVINGROC.NET.